The brilliant white colour, flawless stone and exceptional translucency all represent the qualities sought after by the palace lapidaries to produce Imperial vessels of understated elegance. These qualities are found on the present pair of bowls and have been enhanced by their thinly carved walls, lack of surface decoration and the simplicity of form. These bowls follow the classic shape of their porcelain counterparts, which was an ideal form that complemented the purity of the white jade. The reign marks on the base are cut in typical Palace Workshop style and are identical to that on the base of a saucer included in the Oriental Ceramic Society exhibition, Chinese Jade Throughout the Ages, Victoria and Albert Museum, London, 1975, no. 437; and to another saucer of identical shape and size, sold in these Rooms, 300 Years of Jade, 30 October 2000, lot 654. The pair of bowls and two saucers might well have been part of a set. The imperial connections with this shape of bowl are also apparent in a jadeite bowl, from the same period and with a similar reign mark, with an additional inscription, Xianfeng yuyong, illustrated by Roger Keverne (ed. ), Jade, London, 1991, p. 182, fig. 137. 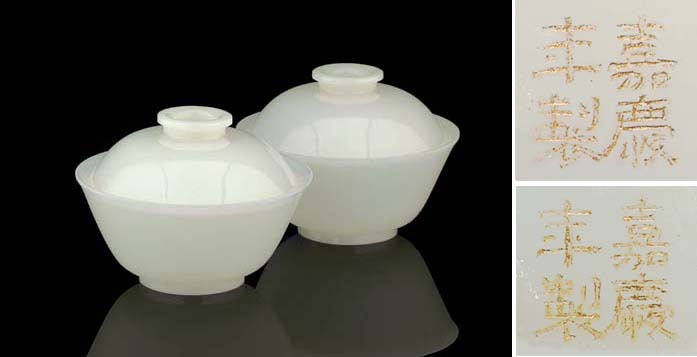 Compare with other examples of white jade bowls, similarly undecorated to show off the quality of the stone: an 18th-century pair with covers, exhibited by S. Bernstein & Co. Oriental Art, Chinese Jade From Distant Centuries, San Francisco, 1992, Catalogue no. 39; and another pair without covers, sold in these Rooms, 300 Years of Jade, 30 October 2000, lot 651, where the shape is compared with that of an Imperial yellow porcelain bowl from the Qianlong period.